The prevalence of both dementia and diabetes is rising as people are living for longer. It is estimated that 800,000 people in the UK have dementia, making up to 64% of those living in care homes. Managing diabetes holistically in this vulnerable demographic will hopefully aid in reducing dementia’s inherent risk of hypoglycaemia and malnutrition, while also limiting hospital admissions and the reductions in quality of life associated with traditional diabetic care. As the care of elderly patients becomes more progressive, it is important to re-evaluate and consider the everyday implications a diagnosis or treatment may have on the individual. Dementia and diabetes are common conditions that are often treated in isolation, while it is their interaction that can also predispose people to poor outcomes. Managing diabetes holistically in this vulnerable demographic will hopefully aid in reducing dementia’s inherent risk of hypoglycaemia and malnutrition, while also limiting hospital admissions and the reductions in quality of life associated with traditional diabetic care. Being in a care home with dementia may lead to a global diminution of enjoyment. Food is often one of the few remaining pleasures in daily life, and with dementia affecting sense of smell and consequently taste, patients may often fnd food becomes blander as dementia progresses. In addition to this, traditional diabetic diets can often be quite limited in variety and as a result patients sometimes develop a reflex sugar craving to stimulate their palate. In order to improve day-to-day quality of life, patients with both dementia and diabetes could have a diet dictated by what they really enjoy, even if this is perceived as less healthy than a strict diabetic diet. The frequency of BM monitoring should also be tailored to the individual, and ideally not done more than once daily (except during periods of very unstable control or unpredictable sugar levels) as finger-prick testing can be painful. 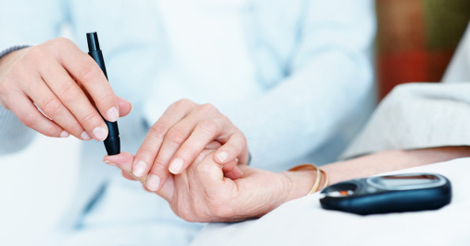 Long-term diabetes may also involve peripheral neuropathy and neuropathic pain, which is often a major contributing factor to agitation and pain in dementia: this should be considered and treated accordingly. Hypoglycaemia is a big fear for both patients with dementia and their carers. The frst part of the brain affected is the frontal lobe, accelerating dementia and damaging the inhibition centre, leading to more disinhibited behaviour and the risks associated with it. Patients may not recognise that they are becoming hypoglycaemic or be able to verbalise new symptoms: this can present as agitated behaviour and as such it must be borne in mind during the assessment of agitation in anybody with known dementia and diabetes. It is well recognised that ‘hypos’ can be a marker for an increased risk of future stroke, myocardial infarction and death. As such, the European Diabetic Working Group Party for Older People led by Professor Alan Sinclair recommends that HBA1C in older people with diabetes should be run at a higher level.4 The same recommendation should be made for this patient group, with an HBA1C of 8.5% as the gold standard and not any lower. Routine management of ‘hypos’ in this particular patient group should be prompt, while also being considerate of the consequences of hospital admission. Staying in the care home is often beneficial overall as it yields more consistent downstream diabetic control, fewer unrecognised hypoglycaemic episodes in unfamiliar surroundings and the continued care of staff that know the patient best. Another risk factor for hypoglycaemia is a changing nutritional state. As dementia advances, patients eat less and may lose significant weight. With this, insulin resistance decreases and consequently so too does the need for diabetic medication. With bi-annual medication reviews, the risk of iatrogenic hypoglycaemia will be reduced, supported by a move away from the sulphonureas towards newer and safer alternatives. The emphasis of care for patients with both dementia and diabetes in care homes should focus primarily on their current physical and mental states, and less on the consideration of 10-year complications. All patients should have an annual review of their diabetes and medication needs, with an HBA1C level, weight and blood pressure. As dementia advances, total cholesterol lowers and the role of statins may become less important in terms of reducing morbidity.5 Reducing the number of medications from this perspective will arguably free up more time for staff to provide holistic care. Withholding unnecessary evening and night-time medication should also prevent episodes of patients being woken up to take their medication. This briefing paper is geared towards a shift in our thinking regarding the care of patients with both dementia and diabetes in care homes. In order to treat in their best interests, we should be moving away from the classical ideal of risk reduction and avoiding long-term complications, towards maximising the overall quality of life experienced in their remaining months and years.